The flavors of Maui can be found at the down-home Azeka's Ribs & Snack Shop in Kihei or the upscale Sea House Restaurant on Napili Bay. Two new publications explore both ends of the spectrum. 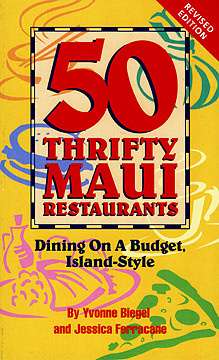 "50 Thrifty Maui Restaurants" by Yvonne Beigel and Jessica Ferracane (Watermark, $8.95) updates a title last published in 2003. A slim paperback, the guidebook is divided by regions, then further divided into breakfast, lunch and dinner establishments. Azeka's, for example, can be found under south-side lunch joints, famed for its kalbi ribs and hearty plate lunches. 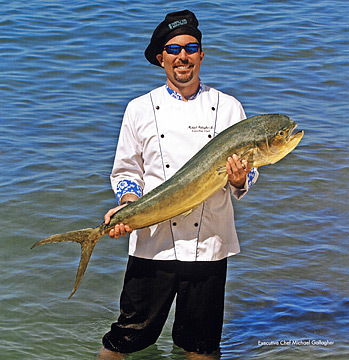 "The Maui Chef Seafood Cookbook" (Island Heritage, $19.99) is by Michael Gallagher, shown at right, chef at the Sea House. Gallagher's recipes for such fare as Uku and Tiger Prawn Bisque are accompanied by stylish photography. At the back of the book is a valuable bonus: a guide to Hawaiian fish, including color drawings and cooking tips. E&O Trading Co. and the Pacific Gateway Center have teamed up to produce a monthly benefit for a program that helps immigrant and low-income entrepreneurs get a foot in the door of the restaurant business. The center offers an "incubator kitchen," where very small businesses can prepare food for commercial sale. Last month, E&O brought a few of them into a restaurant setting for the Street Cart Experience Buffet Brunch. The second brunch will be held from 10 a.m. to 2 p.m. Sunday, with the event to repeat on the third Sunday of each month. On the menu: Rendang (Indonesian beef stew on coconut rice), Hardwood Grilled Satay, Green Tea Soba Noodle Salad, Indonesian Corn Fritters, Fresh Filipino Lumpia and more. Tickets are $30, half of which goes toward keeping the center in operation. Call 845-3918.